Cotton Corporation of India Limited is looking for the Eligible and well talented Job seekers to the engagement of Various vacant posts of Field Assistant, Office Assistants. Recently, Cotton Corporation of India Limited has liberated A job notice regarding CCIL Recruitment. To complete this recruitment process Candidates who want to nourish their career with this reputed organization can attend walkin interview on 6th and 7th October 2018 at the given venue. Eligibility Criteria: Job seekers should have completed the education as Graduation Degree (Any subject/ Commerce/ Science) with good academic records from well recognized Board/ University/ Institute as per the applied posts. Age of aspirants applying for above Vacancy must be above 27 Years As on 01-10-2018. Salary Details: Those contenders who will fulfill the required eligibility criteria for CCIL Vacancies will get a monthly consolidated of Rs. 14,000/- as per the rules of the organization. Selection of applicants for Field Assistant, Office Assistants Will be based on Interview. Visitors have to visit the Official Website to apply for CCIL and that is http://www.cotcorp.org.in. Walk in Interview Held On : 06-10-2018 & 07-10-2018. Click Here For CCIL Job Notification Link. 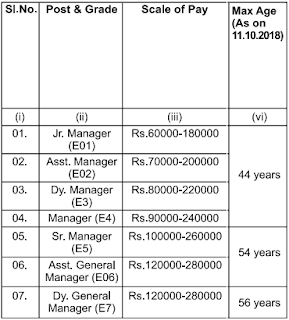 National Aluminium Company Limited has revealed A vacancy advertisement in regard to NALCO Recruitment. Applications are invited from Eligible and well talented Indian Citizens for the engagement of 16 posts of Assistant Manager, Manager, Jr. Manager in various departments. Required Education: Those candidates are having minimum qualification as Candidates who are willing to apply for NALCO jobs must posses Degree in Engineering/ Graduation Degree and/or CA/CMA or MBA from any recognized board or institution can apply. Job searchers who wish to apply for NALCO Jobs needs to go on official site that is http://www.nalcoindia.com. Finally, take a hard copy of same and send application form, documents and certificates in an envelope which should be super scripted on top by “Name of Post Applied For…………………..” at the address well sited below. Recruitment Cell, HRD Department, NALCO Bhawan, P/1, Nayapalli, Bhubaneswar - 751013, Odisha . Opening Date of Online Submission of Application Form Is : 21-09-2018. Closing Date of Online Submission of Applications Form Is : 11-10-2018. Last Date to Submit Filled-In Application : 17-10-2018. Click Here For NALCO Job Notification Link. Contenders can also get latest updates about NALCO Vacancies by bookmarking this page using CTRL+D. A vacancy notification with name as MSSC Recruitment has been dispersed by Maharashtra State Security Corporation. Ambitious, fascinated and proactive Indian Nationals can submit their applications through online mode for the 1500 positions of Security Guard before last date which is 30th September 2018. Qualification Details: Those job hunters have done the 12th from a recognized University or Institution may apply. Age of contenders must be between 18 to 28 Years as on 30-09-2018. Monthly Remuneration: Successfully appointed contenders against this recruitment will attain salary of Rs. 14000/- from recruiting organization. Visit the web portal of organization which is http://mahasecurity.gov.in. This will open a list of the links having latest openings and candidates have to select the most appropriate link which will open the complete advertisement having further details regarding MSSC Vacancies. Click Here For MSSC Job Notification Link 1. Click Here For MSSC Job Notification Link 2. A newest career related advertisement titled as Cabinet Secretariat Recruitment has been strewed by Cabinet Secretariat to inform the Ambitious, fascinated and proactive Jobs Hunter for the 02 Vacancies of Sr. Interpreter, Library and Information Officer. Eligible Aspirants can apply for Cabinet Secretariat vacancy by filling offline application form before last date which is 20th November 2018. Eligibility Criteria: Aspirants must have Diploma in Computer Application, Bachelor Degree in English from well recognized Board/ University/ Institute according to post. Salary Package: Shortlisted aspirants for Sr. Interpreter, Library and Information Officer will receive pay scale of Rs. 15600 – 39100/- With 6600/5400/- Grade Pay which is offered by Cabinet Secretariat. Contenders the first and necessary step is to visit the official site of the organization that is http://cabsec.gov.in. Last date to submit application form : 20-11-2018. Click Here For Cabinet Secretariat Job Notification Link. A newest career advertisement in regard to UKMSSB Recruitment has been issued by Uttarakhand Medical Service Selection Board . Eligible and well talented Contestants can submit application form through online mode for the 138 vacant posts of Assistant Professor before the time limit that is 26th October 2018. Required Education: As per latest MCI-TEQ Regulations - Minimum qualifications for teachers in Medical Institutions Regulations, 1998 (Amended upto 08 June, 2017) . Age of contenders must be between 30 to 45 Years As on 01-07-2018. Pay Band for Uttarakhand Medical Service Selection Board jobs: Those applicants who will be recruited successfully against UKMSSB they will attain salary of Rs. 56,100 - 1,77,500/- from recruiting organization. Selection of applicants for Assistant Professor Will be based on Interview. Contenders the first and necessary step is to visit the official site of the organization that is http://www.ukmssb.org. This will open a list of the links having latest openings and candidates have to select the most appropriate link which will open the complete advertisement having further details regarding UKMSSB Vacancies. Online Application Will Be Received Till : 26-10-2018. Click Here For UKMSSB Job Notification Link.
. Eligible Candidates can apply for NCLT vacancy by submitting application form before the time limit that is 15th October 2018. Eligibility: Candidates must have Officers of the Central Government or State Governments or Union Territories or High Courts/Supreme Court/Courts or Tribunals or statutory organisations or State / Higher Judicial Service holding. will get the salary pay band of Rs. 37400 - 670001/- With 8,700/- Grade Pay (For Post 1), Rs. 15,600 - 39,100/-With 6600/7600 Grade Pay (For Post 2,3), Rs. 9300 - 34800/- With 4200/4600/4800/5400/- Grade Pay (For Post 4-9,14), Rs. 5200 - 20200/- With 2400/- Grade Pay (For Post 10-13). Visitors have to visit the Official Website to apply for NCLT and that is http://nclt.gov.in. Closing Date of Offline Submission of Applications Is : 15-10-2018. Click Here For NCLT Job Notification Link. Department of Government Litigation has issued A latest job notification regarding Department of Government Litigation Recruitment to inform the Result oriented and skillful Job finders for the 28 Vacancies of Office Assistant. Eligible Applicants can apply for Department of Government Litigation vacancy by submitting application form before the last date that is 22nd October 2018. Essential Qualification: Job seekers should have completed the education as 10th with good academic records from well recognized Board/ University/ Institute as per the applied posts. Emoluments: Those applicants who will be recruited successfully against Department of Government Litigation they will attain salary of Rs. 15700 - 50000/- from recruiting organization. Firstly, approach on web portal of Department of Government Litigation . Once the application form filled successfully Job finders should send application form, documents and certificates in an envelope which should be super scripted on top by “Name of Post Applied For…………………..” at the address mentioned in Advertisement. Deadline to Submit the Application Is : 22-10-2018. 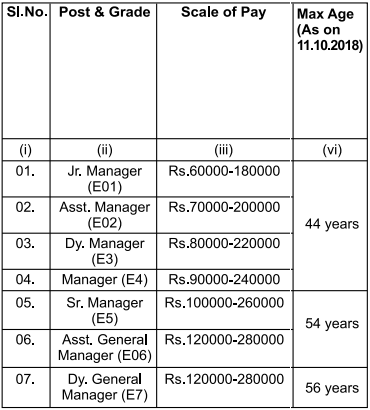 A vacancy notification as Central Jail Raipur Recruitment has been recently advertised by Central Jail Raipur to inform the Dedicated and result oriented Contenders for the 05 Vacancies of Sweeper. Eligible Job seekers can apply for Central Jail Raipur vacancy by filling offline application form till the last date that is 30th September 2018. Academic Details: Aspirants must have 5th from well recognized Board/ University/ Institute according to post. Age of applying candidates must be between 18 to 30 years (For Others), 18 to 35 years (For CG State) As on 01-01-2018. Monthly Remuneration: Applicants who will be appointed against this recruitment they will attain consolidated salary of Rs. 15,600 - 49,400/- from recruiting organization. Contenders the first and necessary step is to visit the official site of the organization that is http://jail.cg.gov.in. Closing Date for Forwarding Filled Application Forms : 30-09-2018. Click Here For Central Jail Raipur Job Notification Link. A vacancy notification in regard to Naval Dockyard Recruitment has been advertised by Naval Dockyard . Hard working and result oriented Participants may submit their prescribed application form for the 118 vacant posts of Apprentice before the time limit that is Within 21 Days. Eligibility Criteria: Those candidates are having minimum qualification as Candidates who are willing to apply for Naval Dockyard jobs must posses ITI from any recognized board or institution can apply. Contenders who want to join this organization they should be born in between 01-04-1997 to 31-03-2004. Selection of applying aspirants will be based on their performance in Written Exam, Medical Examination which will be conducted by the recruitment panel. First of all appliers you have to open the official site of the organization that is http://www.bhartiseva.com. Deadline for Submitting Online Application Form Is : Within 21 Days. Click Here For Naval Dockyard Job Notification Link. Contestants can also get latest updates about Naval Dockyard Vacancies by bookmarking this page using CTRL+D. before the last date that is 28th October 2018. Academic Details: Those job hunters have done the 10th, 12th, ITI certificate in the trade of Electrician, Diploma course of Sanitary Inspector from a recognized University or Institution may apply. Application fee will be Rs.500/-(non refundable) for candidates (except only for Ex-Serviceman) to be paid. Age of applying candidates must be between 18 to 25 years as on 28-10-2018.
will receive pay scale of Rs. 9300 - 34800/- With 3600/- Grade Pay (For Post 1), Rs. 5200 - 20200/- With 2400/- Grade Pay (For Post 2) which is offered by Cantonment Board Ambala. Contenders, interested to apply against Cantonment Board Ambala recruitment they have to go through the Written Test round that will be organized by the recruitment panel of organization. Visit the web portal of organization which is http://www.canttboardrecruit.org. Dead Line For Apply Online : 28-10-2018. Click Here For Cantonment Board Ambala Job Notification Link 1. Click Here For Cantonment Board Ambala Job Notification Link 2. 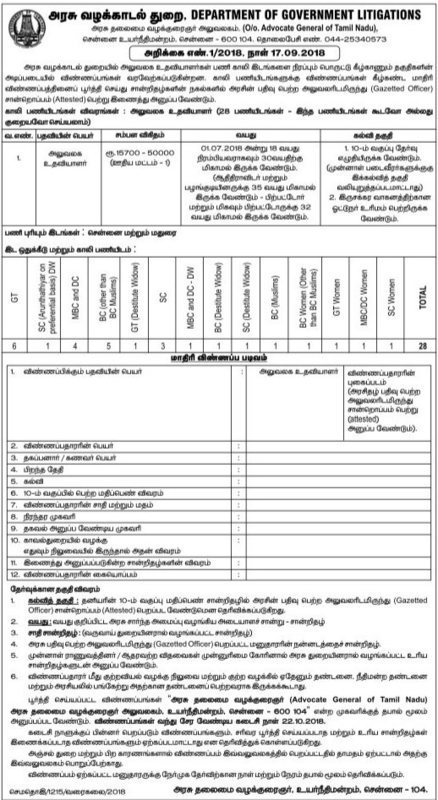 An employment notification titled as Office of Principal Commissioner of Customs Recruitment has been released by Office of Principal Commissioner of Customs to inform the Achievement oriented and skilled Applicants for the 14 positions of Launch Mechanic, Seaman, Greaser. Eligible Job searchers can apply for Office of Principal Commissioner of Customs vacancy by submitting application form on or before the end date that is 12th October 2018. Qualification: Those candidates are having minimum qualification as Candidates who are willing to apply for Office of Principal Commissioner of Customs jobs must posses 10th, ITI from any recognized board or institution can apply. Age of contenders must be between 18 to 30 Years (For Post 1,4), 18 to 25 Years (For Post 2,3). Salary Structure: Selected aspirants for Launch Mechanic, Seaman, Greaser will get the salary pay band of Rs. 25500 - 81100/- (For Post 1), Rs. 18000 - 56900/- (For Post 2,3), Rs. 21,700 - 69,100/- (For Post 4) . A Written Exam, Proficiency Test will be conducting by Office of Principal Commissioner of Customs to select candidates for above stated posts. 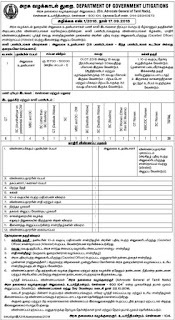 Candidates who want to apply for Office of Principal Commissioner of Customs vacancy they are required to go through the official website of organization that is http://www.vizagcustoms.gov.in. Closing Date to Submit Hard Copy of Application Form Is : 12-10-2018. Click Here For Office of Principal Commissioner of Customs Job Notification Link. High Court of Sikkim has liberated A job notice as High Court of Sikkim Recruitment to inform the Result oriented and hard working Candidates for the 09 positions of Assistant, Accounts Officer, Court Officer. Eligible Individuals can apply for High Court of Sikkim vacancy by filling offline application form till the closing date that is 27th October 2018. Eligibility Criteria: Candidates must have completed the 8th, Bachelor Degree, B.Com, LL.B or its equivalent with good marks from a recognized University / Institution. Age of contenders must be between 18 to 30 Years As on 27-10-2018. Salary Package: Those applicants who will be recruited successfully against High Court of Sikkim they will attain salary of Rs. 15,600 - 39,100/- With 6200/- Grade Pay (For Post 1), Rs. 9300 - 34,800/- With 4200/5000/- Grade Pay (For Post 2-5), Rs. 5200 - 20,200/- With 3400/- Grade Pay (For Post 6,7) from recruiting organization. Assortment of job finders for above posts will be based on their appearance in Written Exam, Driving Test, Viva-Voce which will be conducted by High Court of Sikkim on stipulated date. Contenders the first and necessary step is to visit the official site of the organization that is http://highcourtofsikkim.nic.in. Last Date to Submit Hard Copy of Application Form Is : 27-10-2018. Click Here For High Court of Sikkim Job Notification Link. Contestants can also get latest updates about High Court of Sikkim Vacancies by bookmarking this page using CTRL+D. A job notice regarding SPCB Recruitment has been transmitted by Surat Peoples Cooperative Bank Ltd. Hard working and result oriented Candidates may submit their prescribed application form for the 03 vacant positions of Assistant General Manager on or before the end date that is 5th October 2018. Qualification Required: Candidates must have completed the CAIIB, Post Graduate degree / Double Graduate degree/ Post Graduate Diploma or its equivalent with good marks from a recognized University / Institution. Emoluments: Candidates who will be recruited successfully they will get attractive and satisfying salary of Rs. 94,000/- from SPCB. First of all contenders visit the official website which is http://www.spcbl.in. Last Date To Apply Online Is : 05-10-2018. Click Here For SPCB Job Notification Link. Delhi Judicial Academy is looking for the Skilled & well qualified Applicants for the 12 posts of Field Investigators. Recently, Delhi Judicial Academy has delivered An employment advertisement for DJA Recruitment. To complete this recruitment process Aspirants who are willing to apply for the post they can attend walkin interview on 4th October 2018 at the given venue. Required Education: Job finders should have passed Graduation Degree in Law with good academic records from well recognized Institute / board. Emoluments: Successfully recruited candidates will receive salary of Rs. Rs. 5000/- from recruiting organization. Visitors have to visit the Official Website to apply for DJA and that is http://judicialacademy.nic.in. Walk In Date : 04-10-2018. Click Here For DJA Job Notification Link. A newest career advertisement titled as MPSSDEGB Recruitment has been dispersed by Madhya Pradesh State Skill Development & Employment Generation Board to inform the Diligent and dynamic Individuals for the unoccupied posts of Manager, District Facilitator . Eligible Applicants can apply for MPSSDEGB vacancy by filling offline application form before last date which is 31st October 2018. Essential Qualification: Candidates must have completed the M.A. (Mass Communication)/ P.G.D.M. / M.B.A./ P.G.D.B.M./P.G.D.M. or its equivalent with good marks from a recognized University / Institution. Applicants who belong to the category of SC/ST/PWD/Woman & who are willing to apply they have to submit application processing fee of Rs. 250/-. Age of contenders must be between 21 to 40 Years (For Male), 21 to 45 Years (For Female), 21 to 28 Years (For Other State) As on 01-01-2018. Salary Details: Applicants who will be appointed against this recruitment they will attain consolidated salary of Rs. 75,000/- (For Post 1), Rs. 60000/- (For Post 2) from recruiting organization. Visit the web portal of organization which is http://www.mpskills.gov.in. This will open a list of the links having latest openings and candidates have to select the most appropriate link which will open the complete advertisement having further details regarding MPSSDEGB Vacancies. Zila Panchayat Balod has issued A job notice for Zila Panchayat Balod Recruitment to inform the The most eligible and effective Applicants for the 10 vacant posts of Development & Package Coordinator. Eligible Aspirants can apply for Zila Panchayat Balod vacancy by filling offline application form on or before the end date that is 25th September 2018. Required Education: Candidates must have completed the Graduation/Post Graduation Degree or its equivalent with good marks from a recognized University / Institution. Contenders who are interested to apply for any of the above mentioned positions they should be in between 21 to 45 Years As on 01-01-2018. Salary Structure: Candidates who will be recruited successfully they will get attractive and satisfying salary of Rs. 10,000/- (For Post 1), Rs. 8000/- (For Post 2) from Zila Panchayat Balod. Engagement of aspirants will be based on their performance in Computer Skill Test and Personal Interview that will be driven by the recruitment committee of Zila Panchayat Balod. Job seekers are interested to apply for above mentioned positions firstly they need to go through the official website that is http://balod.gov.in. Last Date for Receiving Hard Copy of Application Form Is : 25-09-2018. Click Here For Zila Panchayat Balod Job Notification Link. A latest advertisement with name as MSSC Recruitment has been strewed by Maharashtra State Seeds Corporation . Goal oriented and skilled Candidates have to submit their application form for the 1500 vacant positions of Security Guard before the time limit that is 30th September 2018. Education Info: Those candidates are having minimum qualification as Candidates who are willing to apply for MSSC jobs must posses 12th from any recognized board or institution can apply. Salary Package: Shortlisted aspirants for Security Guard will receive pay scale of Rs. 14000/- which is offered by Maharashtra State Seeds Corporation . MSSC Vacancies by bookmarking this page using CTRL+D. till the closing date that is 8th October 2018. Education Info: Job searchers should have Graduation Degree In Any Discipline / Post Graduation Diploma/ Master Degree/ MBA/ Degree Or Diploma In Relevant Subject or equivalent examinations from any recognized board / institute. Candidates belonging to SC/ST and PWD/Ex-S categories are exempted from payment of application fee. Age of aspirants applying for above Vacancy must be above 26 Years As on 01-09-2018. Monthly Remuneration: Successfully appointed contenders against this recruitment will attain salary of Rs. 60,000 - 1,80,000/- from recruiting organization. Selection of applicants for Engineer, Human Resources Officer, Safety Officer Will be based on Written Exam, Interview. First of all, aspirants have to visit the web portal of organization that is http://www.cpcl.co.in. Commencement of Online Application Form Is : 24-09-2018. Closing Date of Online Submission of Applications Form Is : 08-10-2018. Date of Examination : 11-11-2018. Click Here For CPCL Job Notification Link. An employment advertisement in regard to CCRT Recruitment has been revealed by Centre For Cultural Resources And Training. Diligent and dynamic Job appliers have to submit the form through online mode for the 400 vacant posts of Junior & Senior Fellowships before the time limit that is 16th October 2018. Essential Qualification: Those candidates are having minimum qualification as Candidates who are willing to apply for CCRT jobs must posses Graduation Degree from any recognized board or institution can apply. Contenders who want to join this organization they should be in between 25 to 40 Years (for Junior Fellowships) As on 01-04-2018. Contenders who are willing to apply for above mentioned post they should be below than 40 Years (Post 2) As on 01-04-2018. Monthly Remuneration: Successfully appointed contenders against this recruitment will attain salary of Rs. 10,000/- (For Post 1), Rs. 20,000/- (For Post 2) from recruiting organization. Engagement of applicants will be completed against this recruitment on the basis of their presentation in Interview / Personal Talk that will be conducted by the recruitment panel of organization. First and foremost step you have to take is for opening the official site, which is http://indiaculture.nic.in. Director, CCRT, 15A, Sector-7, Dwarka, New Delhi-110075. Deadline for Submitting Online Application Form Is : 16-10-2018. Click Here For CCRT Job Notification Link. A newest career related advertisement in regard to ERDO Recruitment has been released by Education Research and Development Organization. Dedicated and result oriented Job finders have to submit their application form for the 13634 unoccupied posts of DEC, BEC, BTT till the last date that is 18th October 2018. Academic Details: Those candidates are having minimum qualification as Candidates who are willing to apply for ERDO jobs must posses Graduation Degree /B.Ed/ BTC/ B.P.Ed/ D.Ed./ NTT/PTT, M.Ed, M.A education, M.Phil & Ph.D from any recognized board or institution can apply. Aspirants belonging General / OBC Category need to submit application fee of Rs. 450/- (For Post 1), 600/- (For Post 2,3). Applicants who belong to the category of SC/ST who are willing to apply they have to submit application processing fee of Rs. 250/- (For Post 1), 400/- (For Post 2,3)/-. Applicants who belong to the category of PWD who are willing to apply they have to submit application processing fee of Rs. 50/-. Age of applying candidates must be between 21 to 45 Years (For Post 1), 22 to 45 Years (For Post 2), 24 to 45 Years (For Post 3) As on 01-07-2018. Salary Structure: Those contenders who will fulfill the required eligibility criteria for ERDO Vacancies will get a monthly consolidated of Rs. 10,500/- (For Post 1), Rs. 18,450/- (For Post 2), Rs. 26,200/- (For Post 3) as per the rules of the organization. Contenders, interested to apply against Education Research and Development Organization recruitment they have to go through the Merit List round that will be organized by the recruitment panel of organization. Contenders the first and necessary step is to visit the official site of the organization that is http://www.erdo.in. Starting Date For Online Application Is : 16-10-2018. Online Application Will Be Received Till : 18-10-2018. Click Here For ERDO Job Notification Link and Apply Online.